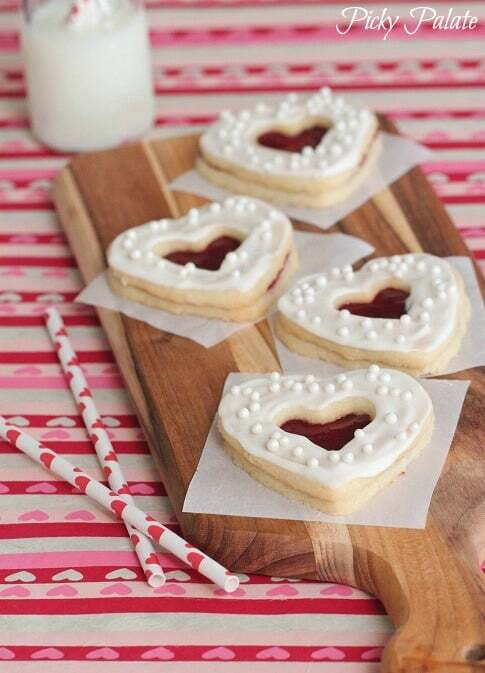 Sharing the most adorable Shortbread Cookies with you today, perfect for Valentine’s Day! 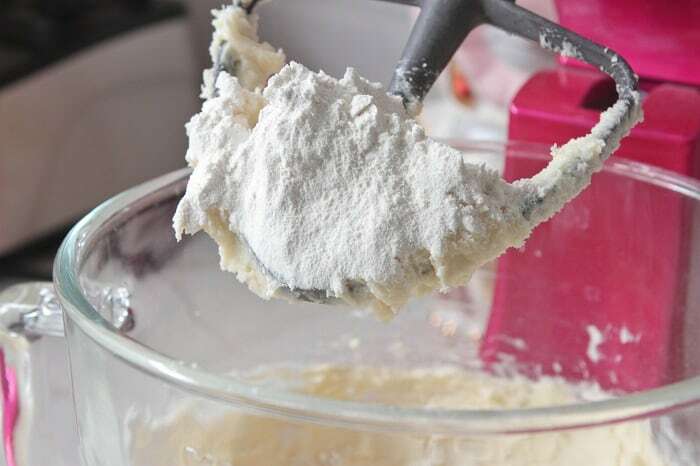 This is the best shortbread cookie recipe you’ll need, buttery sweet perfection! Shortbread cookies are some of my favorite cookies to make and of course EAT! The buttery sweet combo is dangerously delicious. Hope you enjoy my cookies perfect for Valentine’s Day….or really any occasion. What Is A Shortbread Cookie? Did you know shortbread cookies consist of mainly just 3 ingredients? Butter, Sugar and Flour! I mean, how could they not be delicious? 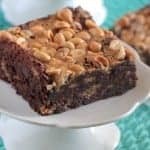 Such a simple recipe with sweet buttery crisp flavor. My favorite! Beat the butter and sugars until light and fluffy like this. Add your flour and salt to the bowl. There we go, now time to roll it out. No need for chilling in the refrigerator. 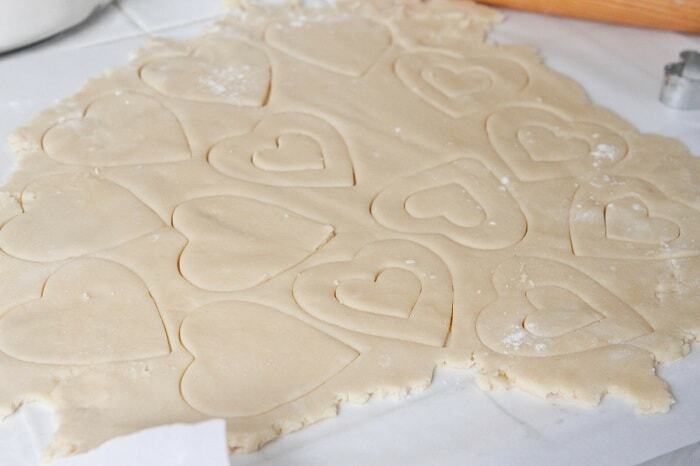 Find some heart cookie cutters in your supply. I used a 3 inch and then a 1 inch to create these cookies. Transfer them to your baking sheet. 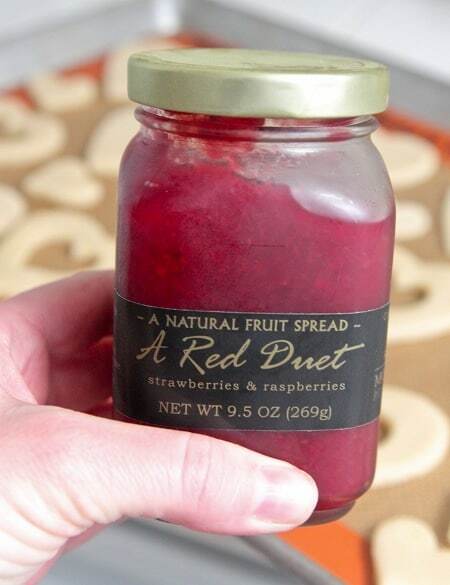 Use a spreadable jam of your choice for the 3 inch cookie shapes. Perfect, now time to bake! While the cookies are baking, make the icing. All you need is powdered sugar and heavy whipping cream. The icing should be nice and thick, but spreadable just like this. 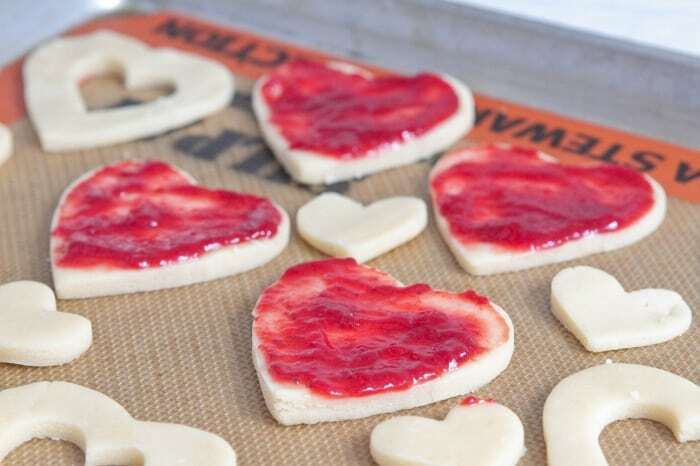 Once the cookies are cool enough to handle, place the heart centered cookie on top of the solid heart jam covered cookies. 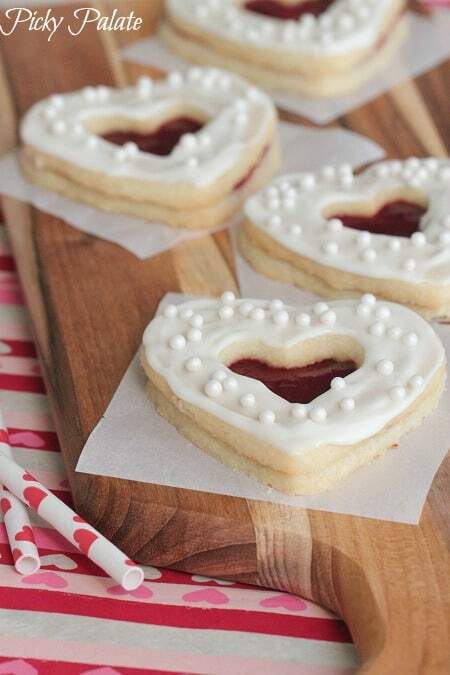 Make sure you spread jam on the inside of the small hearts and top with icing. Aren’t they pretty?! Can’t wait for you to try these! Preheat oven to 350 degrees F. and line a large baking sheet with a silpat liner or parchment paper. 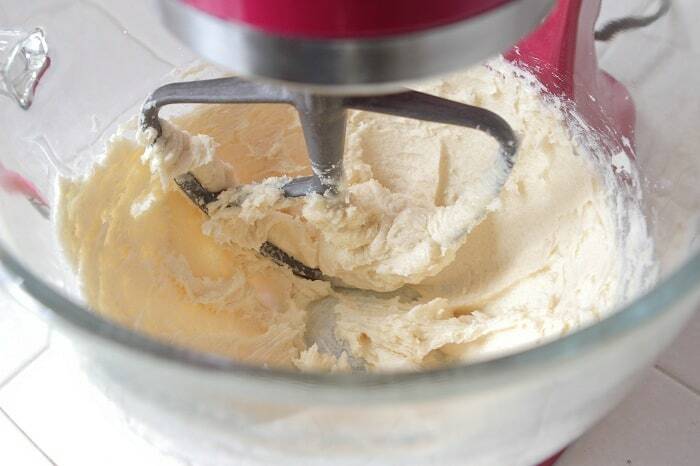 Place butter, sugars, flour and salt into stand mixer, mix until well combined and dough forms. Transfer to a parchment lined countertop and roll to about 1/4 inch thick round. 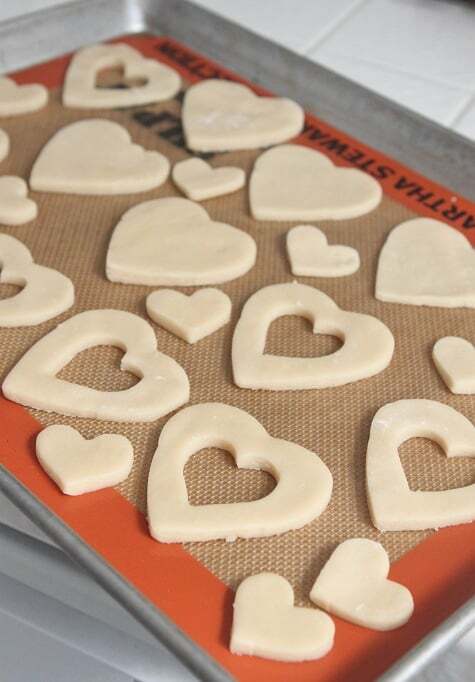 Use heart cookie cutters to form cookies and transfer to baking sheet. Spread a thin layer of jam on only the whole hearts. 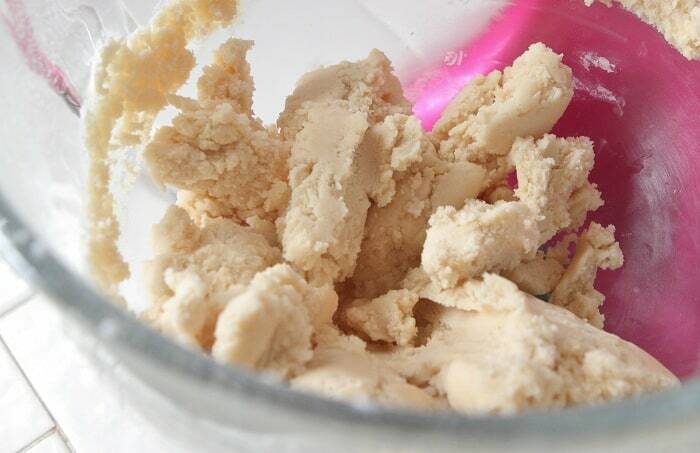 Freeze sheet of cookies for 10 minutes before baking. This helps the cookies hold their heart shape. Bake for 12-15 minutes until slightly golden. Let cool for 10 minutes before transferring to cooling rack. I like to spread another light layer of jam over the warm cookies that had jam already, this helps the cookies stick together nicely. 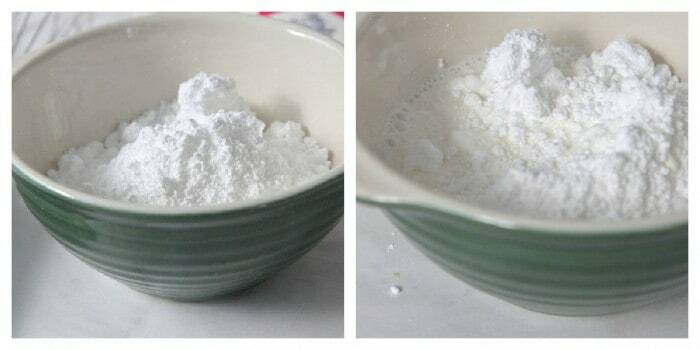 Place powdered sugar and cream into a bowl, whisking to combine. 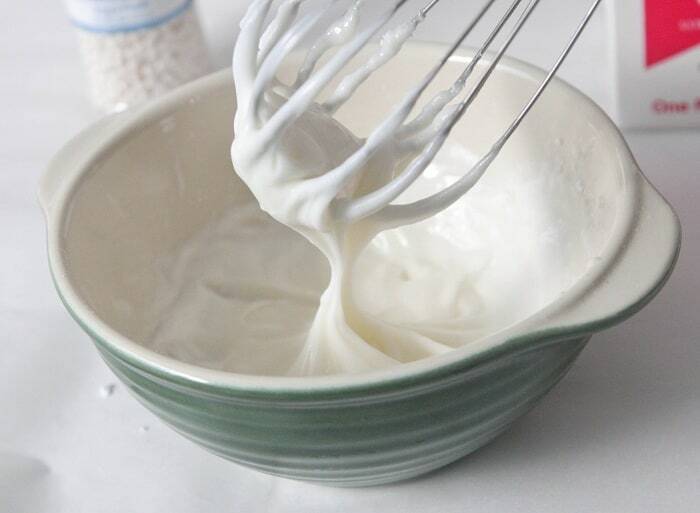 Add additional cream to desired icing consistency. Frost over cooled cookies and sprinkle with sprinkles. 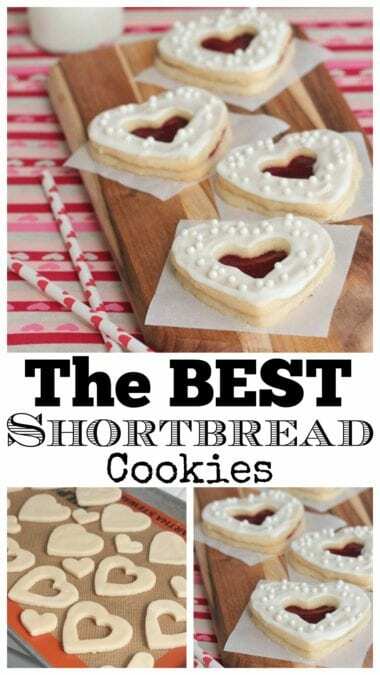 Make sure to use the mini heart shapes to make cookie sandwiches. Sandwich with jam then top with icing. Enjoy! Jenny they’re beautiful! You have more patience than I do, but clearly, they’re worth it! What a gorgeous cookie! These are perfect for Valentine’s Day! These are stunning, Jenny! I love the sound of that combo preserve you used! I would have to say these are indeed fancy, and look divinely buttery and flakey, my favorite cookie. Jenny! These are so perfect and pretty! That strawberry/raspberry filling sounds amazing, too!!! But where did the little hearts disepeared ? 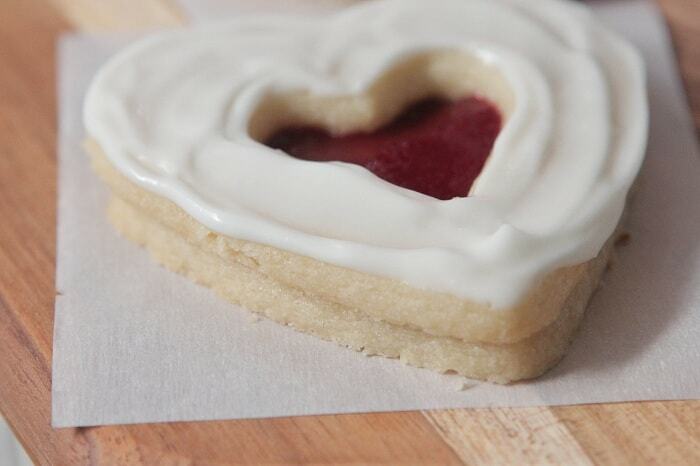 I love jam and shortbread…add some icing to that and you have the perfect cookie! these are beautiful – i think they are perfect! So dainty! 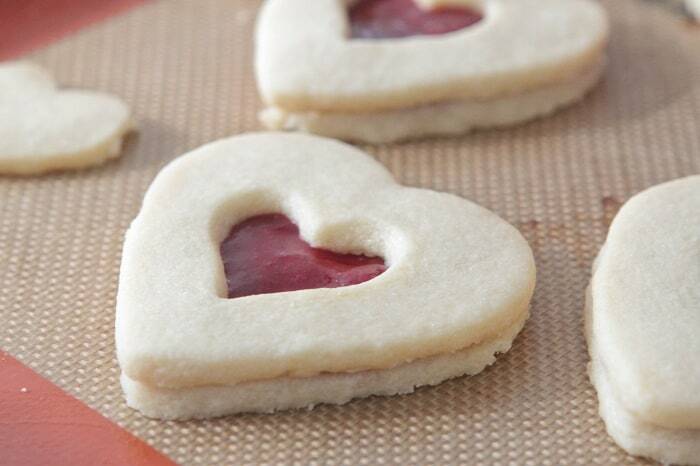 I think the only thing that can make shortbread better is to add some jam and put it in the shape of a heart. I love it! I definitely look for any reason to make things in the shape of a heart this time of year! 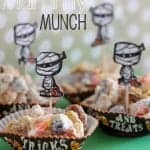 Jenny, these are so cute and look delicious! They look so tender and perfect! I’ve never seen such a perfect looking Valentine cookie! Perfect for every “love” in our lives! Thanks for the share and your photos are gorgeous! These are beautiful ! Your mixer is too love that color, and the straws are darling! Happy V Day :). Such a sweet cookie for , I bet, very sweet valentines! I like that mixer, too! Girl! These are so gorgeous! Jenny, these are such lovely cookies for Valentines Day! THESE are so darling! My kids would love em! These look adorable and very tasty. We’re looking forward to eating them, so my little guys and I are going to try it again the other way. Thanks for the inspiration! Okay, so a little update: I didn’t throw the dry dough out, I just mixed a bit of heavy cream in with it and it binded it together very nicely. The cookies turned out great! They’re cute and very delicious. Highly recommend. Joanne, thanks so much for commenting here! I made the same mistake as you! I was making these for my sister’s engagement party (they went down a storm!) But made the same mistake. I was so flustered and upset but I saw your comment and regained some composure! I didn’t have any cream so I added an egg instead. It bound the ingredients together perfectly and everybody loved the cookies! 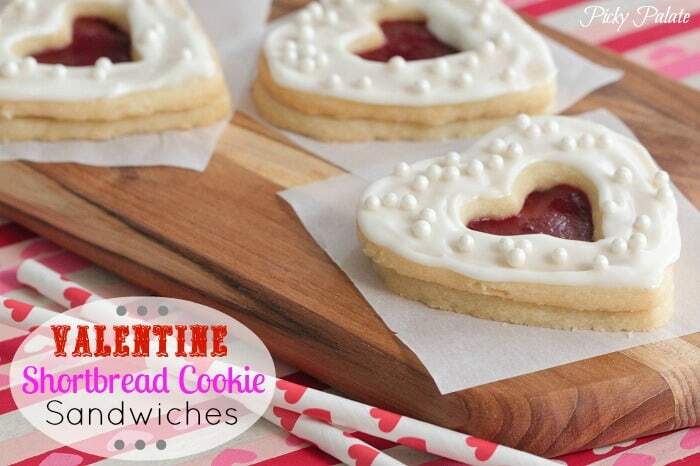 My Valentine would LOVE these little cookie sandwiches! They’re precious! They’re beautiful! They would make the perfect Valentine’s Day gift for a girlfriend or mom. I appreciate the patience that this type of cookie requires! They are actually pretty easy to assemble, I promise, lol! So perfect for Valentine’s Day! Adorable. So fabulous! Where did you get your jam? These are so cute, Jenny! The jam on them looks sooo good too! I will be making them with my little Princess for Valentines Day. I told her and She is excited. We made Linzer cookies like this for Christmas. These cookies are adorable and look so tasty! I would like to know where you got that jam from, it sounds yummy! Thank you! These are so pretty. Perfect for a wedding! The dough just seems dry. I had to squish it together with my fingers and it came together perfect. I made two logs and wrapped them and now they’re in the freezer, I think they’ll be great slice and bakes. 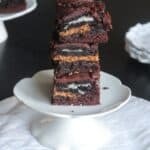 I made these for my husband on Valentines day and he absolutely loved them! Thank you! I only had a 2in heart cutter so I want to make them again, but bigger. My husband would eat 4-5 cookies at a time they were so yummy, haha.